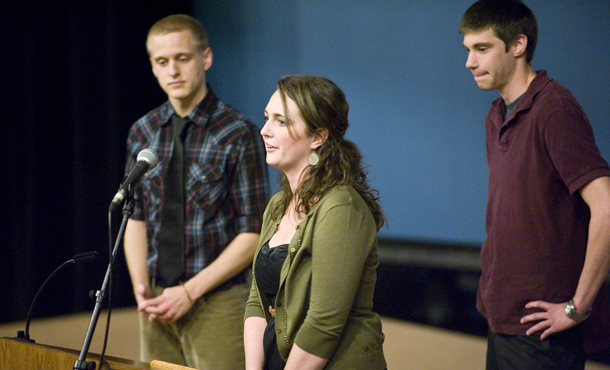 EMU students Justin Roth (left), Kelby Miller (center) and Cody Troyer discuss the Weaving Life documentary. Photo by Justin Falls. Dan Terry devoted his life to helping Afghan people. For nearly four decades, the humanitarian aid worker coordinated small-scale community development projects throughout the struggling country until his murder in 2010. The 64-year-old was among 10 humanitarian aid workers murdered on Aug. 5, 2010, as they were returning to Kabul from a medical relief trip in the northern part of Afghanistan. Eastern Mennonite University alum Glen Lapp and Harrisonburg resident Brian Carderelli also were killed in the ambush. On Friday night at the MainStage Theater in University Commons, 16 EMU students from the university’s visual and communication arts department unveiled a 57-minute documentary, “Weaving Life,” which portrayed Terry’s life. Paulette Moore, a media arts and peace building professor, thought of the idea for the documentary after one of Terry’s friends, Jonathan Larson, spoke during a university chapel service. Kelby Miller, a 22-year-old senior from Sarasota, Fla., served as the senior producer for the project. The film depicts Terry’s unique approach to humanitarianism. Justin Roth, a 21-year-old senior from Bettsville, Ohio, served as the project’s editor. Roth said he learned a great deal about Terry’s life during the semester-long project. “We learned a whole lot about Dan through the stories of other people,” he said. MennoMedia, which produces documentaries through the National Programming Committee of the National Council of Churches, plans to prepare the film for airing on ABC television stations this fall.